Tens of thousands of turkeys are being gassed at a farm in Suffolk in a bid to contain Britain's first mass outbreak of the H5N1 strain of bird flu. A biosecurity zone has also been set up around the Bernard Matthews farm near Lowestoft - where the virus was first discovered - as a precaution. Lorry loads of the carcasses are being taken to Staffordshire to be destroyed. The H5N1 virus can be fatal if passed on to humans, but health experts said that risk was "very low". A three-kilometre protection zone and a 10km surveillance zone have now been set up around the farm in Holton, about 27km south-west of Lowestoft. A much wider restricted zone covering 2,090 sq km is bordered by the A140 to the west and the A47 to the north and almost to Felixstowe in the south. Government vets said 50,000 turkeys had been gassed at the farm by 1300 GMT on Sunday. But no time scale has yet been set for completing the cull. Fourteen sealed lorries containing the bird carcasses are travelling to a rendering plant in Cheddleton, Staffordshire, where they will be destroyed. The authorities have responded to criticisms in newspapers suggesting that they responded slowly to the outbreak. Fred Landeg - the government's deputy chief vet - rejected such claims, pointing out that a vet was first called out on Tuesday, but turkeys only began to die in significant numbers two days later, suggesting that avian flu may be the cause of the deaths. "The premises were immediately placed under restrictions and an investigation started," he said. Earlier, he said the most likely source of the outbreak could have been wild birds. Farmers in the restricted area have been told to keep their flocks isolated from wild birds and any movements must be licensed. The authorities have reassured the public that the outbreak has been tackled quickly. The virus has so far been detected in only one shed out of 22. Jill Korwin, assistant head of Trading Standards for Suffolk, said: "At the moment we are very encouraged that it has been contained." United Nations co-ordinator for bird flu David Nabarro has said farmers will have to get used to the presence of the disease in the UK as it is "going to be in bird populations for several years to come". He said: "The way in which we'll deal with it is by implementing the well-rehearsed plan, which is to stamp it out at source. We've got to learn to accept that, not see it as a serious problem and just get on with normal poultry-rearing and consumption." The virus has killed 164 people worldwide - mainly in south-east Asia - since 2003. So far, all those who have been infected worldwide have come into close contact with infected birds. However, Health Protection Agency chief executive Professor Pat Troop stressed that the virus "doesn't pass easily from bird to human" and the risk to the general population from the outbreak was "very, very low". Sir David King, the Government's chief scientific adviser, also dismissed concerns about the possible spread to humans. "This doesn't add to the likelihood of it leading to a human pandemic at all. This doesn't add to the scare one little bit," he told ITV1's The Sunday Edition. 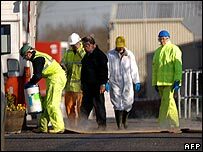 Health Secretary Patricia Hewitt said the government was preparing for the remote possibility of a human flu pandemic. "We are preparing very, very seriously and thoroughly for the possibility of a pandemic flu," Ms Hewitt told The Sunday Edition. She added: "It is a very remote risk, but if it did happen it could be very serious indeed." The Department of Health has taken the advice of scientists and stockpiled enough of the Tamiflu anti-viral drug to cover a quarter of the population, she said. 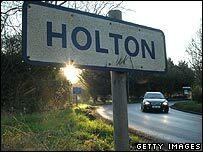 So far, 100 of the 2,000 staff who work at the Holton farm site have been given the drug. A spokesman for the Transport and General Workers Union said the 100 were the "limited number" of people who had worked in the shed where the outbreak was discovered. The Department for Environment, Food and Rural Affairs has said the flu virus is the "highly pathogenic" Asian strain, similar to a virus that was found in Hungary in January. In that incident, the first time bird flu had occurred in the European Union since August 2006, a flock of 3,000 geese was killed. A spokesman for the Bernard Matthews company, which runs the farm in Holton, said none of the affected birds had entered the food chain and there was no risk to public health. The firm has advised its employees in Norfolk to report for work as usual on Monday, while it will contact Suffolk workers directly if they are required. 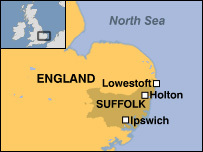 All personnel in Suffolk should go to work as usual on Tuesday. In May last year, more than 50,000 chickens were culled after an outbreak of the H7 bird flu in farms in the neighbouring county of Norfolk. 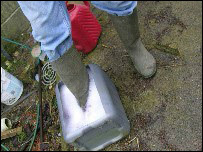 One member of staff at the farm contracted the disease and was treated for an eye infection. In March 2006, a wild swan found dead in Cellardyke, Fife, was found to have the H5N1 strain of the virus. If you have any pictures from the scene you can send them to yourpics@bbc.co.uk or text your pictures to 07725 100 100.